This entry was posted in PPG General Posts on 07/12/2017 by Wendy Winson. This newsletter was set up to be read either online or on paper – and copies are available at reception. It was produced by practice staff in cooperation with the Patient Group. This entry was posted in PPG General Posts on 06/12/2017 by Alan Thomson. A display board kit was obtained for use by the Patient assembly and Patient groups. Here it is being used by the Gainsborough PPG at Tesco Warfield on Friday 17th November. 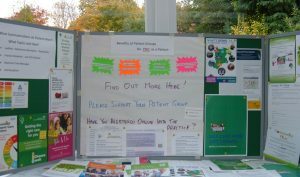 We promoted Self Care Week and supporting our Patient participation Group. It fits on top of a table – such as a folding pasting table. You can add your own notices and leaflets as appropriate. It has been used at events such as the CCG AGM, and is available for Patient Groups to borrow. Contact alan.thomson@bcs.org if you wish to arrange that.